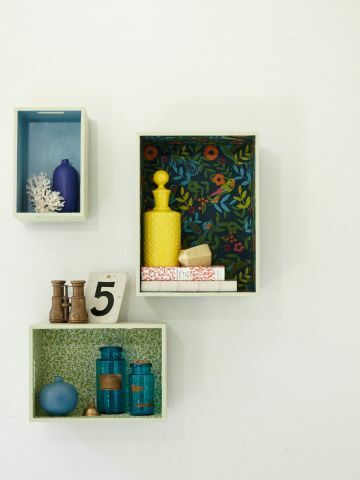 Turn simple wood boxes into decorative cubbies. Hardware for hanging: nails, D-ring hooks, sawtooth picture hangers or eyes and picture wire. For a finished look, paint plain boxes or crates inside and out. Set aside to dry. Repeat with a second coat, if needed. Decorate interior of cubbies, if desired, with patterned paper. Cut pieces of paper to fit. 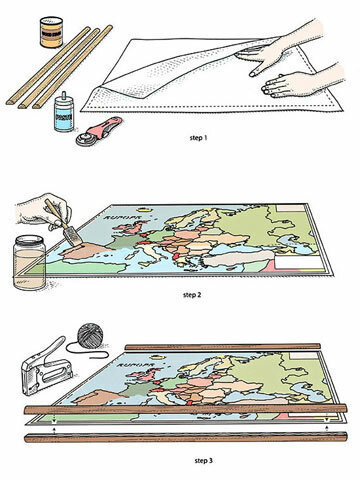 Working with one piece of paper at a time, apply adhesive to blank side and press onto inside of box, starting at the back and finishing with the four sides. Or you can paper the inside back of the box only. Lightly mark the wall with pencil where you want cubbies mounted. Once nails are in place, be sure to clean the wall of marks and any scuffs. Use hardware appropriate for the weight of the finished boxes and display items. Attach hangers to each box or crate following package instructions. We used: Hobby Lobby Wooden Crates, hobbylobby.com for stores. Benjamin Moore Guilford Green (HC-116) paint for box exteriors, benjaminmoore.com for stores. Cost Plus World Market blue bird floral paper, available at Cost Plus World Market stores. Paper Source green geometric paper, papersource.com.